Various catastrophes preceded by broken-down buildings remain blocked, and cellular networks are decommissioned. Individuals can be located using the signal emitted by their mobile phones. The general system consists of two types of equipment:a central equipment and several reception equipment located around the area under analysis. 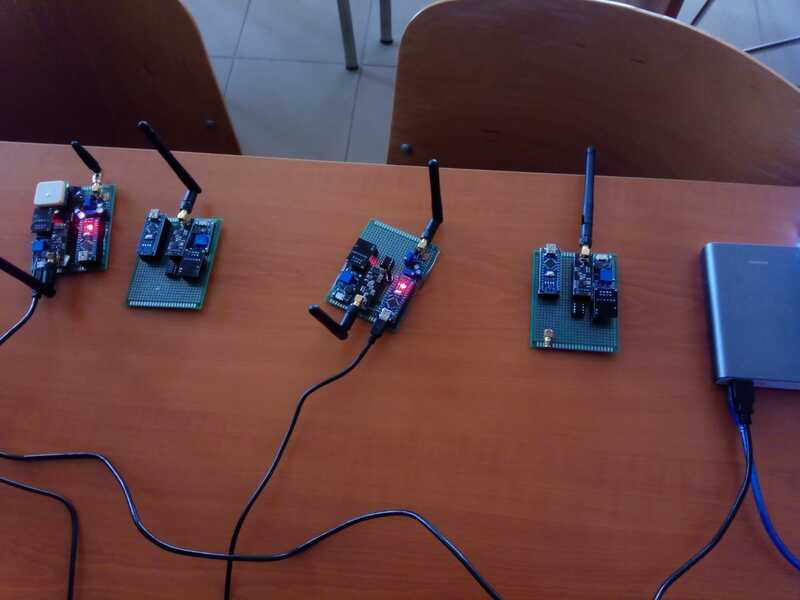 The receiving equipment is composed of: GPS module, accelerometer module, radio detection module from a set frequency range, module for transmission of information to the central subsystem. The central equipment includes: GPS module, accelerometer module, receive module information from the receiving equipment.Calibration module is based on a signal processing card for measurement-based propagation models and parallel calculation by FPGA algorithms to accurately determine the location of radio signal sources and graphical interpretation on the map built by the entire system. Radio Defined Software (SDR) is an innovative technology applicable to a wide range of areas requiring radio links. SDR technology offers an efficient and relatively inexpensive solution, being very flexible in architectural terms, compared to classical radio architectures. Simply put, SDR technology represents all the elements of a radio chain, in which some functions, or even all, are defined by software. The benefits of Radio Definite Software (SDR), such as the reuse of source code or the easy updating of key SDR architecture elements, have led to the development of specific standards for the final destination of software-defined radio equipment (SDR), the universal platform on which can implement these functions as a great advantage in the realization of the radio chain. Cognitive Radio is the newest concept in research into new radio communications technologies. Once Radio Definite Software has become a reality, Radio Cognitive Technology is the next step toward developing radio communications. The idea of Radio Cognitive emerged from the need to use radio spectrum in a more efficient way and to use the most effective form of communication for given conditions. Using existing technology, it is possible to design and develop radio systems capable of analyzing radio spectrum, detecting free frequencies, and using the best form of communication for given conditions. In this way, Radio Cognitive Technology is able to independently select the frequency band, the modulation type, to adjust the output power, taking into account the conditions and rules of communication required by law for a particular geographical area. ITU: Cognitive Radio is a system that analyzes a certain spectrum of the radio spectrum, being able to adapt its autonomous and dynamic parameters, depending on the opportunities. FCC: Cognitive Radio can adapt its transmission parameters based on interaction with the radio spectrum in which it operates. NTIA: Cognitive Radio is a system able to analyze the electromagnetic environment (the spectrum in which it works) and can dynamically and autonomously modify its operating parameters such as: emission control, minimizing interference, facilitating interoperability (adapting to different types modulation). WWRF: Cognitive Radio implies dynamic measurement and analysis of radio frequency time-frequency-power parameters to make an optimal choice of working frequency, bandwidth to achieve quality communication. In the radio-cognitive concept, the radio frequency sections must be very flexible not only to scan the frequency bands but also to select working modes that occupy different bandwidths. For this performance, a very flexible front-end (input circuits) is needed; therefore, the signal digitization must be made at or near antenna terminals, the analog front-end coming out of discussion. For such a performance, converters with a huge dynamic range, capable of operating at more than GHz, are needed. At today's technological level, this is not possible, the requirements for radio cognition can not be met, but, undoubtedly, this will happen in the near future, making radio-cognitive a reality. The propagation attenuation between a pair of antennas represents the ratio of transmitted power to received power, generally expressed in decibels. Includes all possible mitigation elements associated with interactions between electromagnetic waves and any object between transmitting and receiving antennas . For channels very affected by rapid fading, such as mobile channels, propagation attenuation applies to power over several fading cycles (local average attenuation). These attenuation are difficult to measure directly, as various mitigation and gains in the radio system have to be considered. These are best analyzed by building a transmission budget, which is generally the first step in analyzing a radio communication system. In order to effectively define propagation attenuation, mitigation and gains in the system must be taken into account. The elements of a direct radio link are shown in Figure. In the literature, there are numerous approaches to the propagation of radio waves from ruined sources in post-disaster situations. Thus in  is proposed an empirical model with large-scale fading that is able to estimate the attenuation between the base station and a cell phone under the earthquakes in the GSM bands of 900 and 1, 800 MHz respectively, a model made up of two part. The first part is the attenuation of the path in the free space between the base station and the penetration point outside the ruins, calculated using the Walfisch-Ikegami model. In the second part was introduced a simplified model, representing the attenuation by ruins. This model refers to an ideal structure, composed of parallel stratified ruins, and it is assumed that the attenuation of the path is linear through the stratified structure; later research will analyze the "chaotic structures" present in real emergency situations. Also, in  two possible scenarios are studied. The first scenario refers to a situation of high disaster, or a totally collapsed building. The emission source was buried under a large amount of debris, the signal being greatly attenuated by the large volume of disturbing elements. In the second scenario, buildings that were partially affected by the disaster were used to measure, the broadcasting source (868 MHz) being in one of them, finding that the radio signal was largely affected by multi-path propagation. In  a disaster scenario was simulated in the anecoid chamber, measuring the attenuation by typical obstacles for such situations (iron-concrete and brick). It has been concluded that these materials behave differently at frequencies of 900 and 1800 MHz, multi-path propagation and diffraction phenomenon affecting different radio signals in different ways. In  is studied the development of electromagnetic screens, capable of protecting electronic devices inside large buildings against weapons electromagnetic. The experiments were carried out in three large buildings, scheduled to be demolished by implosion, the measurements being made at different frequencies, including those used in mobile telephony, respectively 900 and 1800 MHz. Three sets of data were purchased. 1. Before implosion - the emission sources were located in different areas of the buildings, the measurements being made from the outside. 2. Before, at the time of implosion and immediately after implosion, comparing the power of received signals both from the intact building and from the ruins after implosion. 3. The third set of data was erected, monitoring the signals received through the metal debris (reinforcements, long electric wires) that were exposed after the collapse of the buildings. These metallic elements behaved like radiators, which made the reception of the signals much improved in some cases. be small enough to be integrated on robotic platforms, be cheap but in the same safe operating time, aiming primarily at making measurements similar to the precision of laboratory instruments. Figure 6.1 shows a block diagram general for the reception of signals from underground radio devices and purchase by a digital system. Autonomous system for locating people under dredges.